Springtime is that time of year when people remove their winter cover to discover that the water level in there pool is lower than it was in previous years. What does one do? First thing might be to assume that your pool’s liner has failed but this would be a wrong assumption to start with. It is not unlikely for water levels to be different from spring to spring depending on previous winter. Cold, snow weight, rain and other types of weather can have a huge say as to what your water level might be when uncovering the pool. Try putting some water into the pool and marking the top level. Wait a couple days and look at your mark. If you are losing water it will be apparent during this first check. If it is to close to make a decision one way or another, wait another couple days. This will give you the best approach to knowing if your pool’s liner is leaking or if it was simply water displacement from wintertime. Finding pool leaks are difficult in a pool. If you are unable to locate a leak successfully we would recommend replacement over hiring a company to search for a leak. It is true that leaks can easily be fixed with a patch however locating one could take a long time. Harmony-with-finished-deckMost leak companies have hourly rates and find leaks about 50% of the time at best. With results like this it is often best to replace a liner. 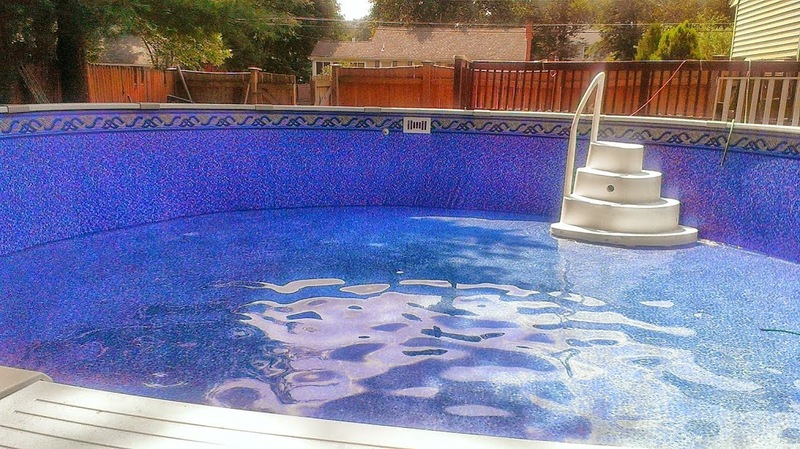 Please follow the following article for a successful pool liner replacement or call on us to help you.